How will I know that my Birthday Party reservation is received? You will receive an email confirming your Birthday Party reservation to your email address. Please note that the reservation rental fee MUST be made within two days of making the reservation or your reservation will be cancelled. What is included in each guest’s Birthday Party Package? Each guest will receive one ticket for the reserved movie, a Birthday Party cup with beverage and a box of popcorn. How do I pay for my Birthday Party reservation rental fee? Cash, credit card and gift card payments are accepted at the theatre. Credit card payments can be made over the phone. Please visit or call the theatre where you have reserved your Birthday Party during regular business hours. You are only required to pay the reservation rental fee prior to the date of your Birthday Party. The Birthday Party packages, as well as any additional concession items for your Birthday Party will be paid prior to the viewing of your selected movie on the date of the reservation. Can the Birthday Party reservation rental fee be paid with a personal check? We do apologize, but we do not accept personal checks for any transaction. Malco Theatres accepts cash, credit cards and gift cards for all transactions. Each theatre has set times slots for Birthday Party rentals. Most Birthday Party locations have early morning private Birthday Party times. Most locations have matinee Birthday Party times. And some locations have evening Birthday Party times. The Birthday Party Reservation Site will show you all available time slots for your local theatre. How will I know what time my movie starts in relation to my reservation time slot? Where can I find the address and phone number for my local theatre? The address and phone number for your local theatre can be found at www.malco.com, under the Times/Locations/Tickets tab and then clicking your local theatre, or by opening up the Malco App on your smartphone. Please remember to call or visit during regular business hours of your local theatre. How do I get information regarding a movie that has not come out yet? Please contact your local theatre during regular business hours to find out if the movie will be showing at that location. It is possible that the theatre may not yet be booked for the movie you are interested in reserving for your Birthday Party. 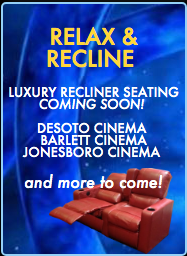 Or you may contact us by email at comment1@malco.com. Will the movie I prefer still be showing for the date of my Birthday Party? When you are making your Birthday Party reservation, you will notice that along with the movie title are the anticipated dates the movie will be playing . Please click on a movie within your desired date range to reserve your party. For questions regarding any dates outside the listed date range, please contact us by email at comment1@malco.com. What if there are no appropriate movies available for my child on the date I want a reservation? Unfortunately, there are certain times during the year that the film studios do not have any child friendly or family films available for us to show. How do I make changes to my Birthday Party reservation? What if I need to cancel my Birthday Party reservation? Visit, call or email your local theatre where you have made your Birthday Party reservation. You do have the option to reschedule your Birthday Party time to another available time slot if you give at least a two day notice prior to the original reservation. Please note that the reservation rental fee is non-refundable if you cancel your reservation. I do not want to pay for the invited children’s parents and siblings to see a movie, but they want to stay. What should I do? For Birthday Parties with scheduled party room times, you will need to pay for each invited guest. Guests you are not paying for are welcome to purchase tickets at regular ticket prices from the box office and any concessions from our concession stand at regular prices. For early morning private Birthday Parties, you will be responsible for payment of all individuals in attendance, whether they watch the movie or not. I am not sure how many guests will be attending my Birthday Party. Do I need to contact the theatre with a final count if it is different than my original reservation? We only need to know if the change in your total number of guests is a significant change (e.g. 10 people or more). Please note: Regardless of how many actually attend, you must pay for the minimum attendance requirement. Do I pay for the estimated number of guests, or the final number of guests who show up? You are only charged for the number of guests who attend the party, but you must pay for the minimum attendance required for the party. Your online party reservation is an estimate of total costs. How far in advance should I make my reservation for a Birthday Party? We recommend booking Birthday Parties about one month in advance. Birthday Parties must at least be booked three days out from your desired reservation time . Please visit the Birthday Party Reservation Site or call your local theatre during regular business hours to check availability. Will the theatre provide a storage area for our gifts and personal items during the movie? Please make arrangements in advance to remove all personal items when exiting the Birthday Party room . Malco Theatres is not responsible for lost or stolen items. May we bring outside food into our Birthday Party? Outside food and drinks are not permitted, with the exception of cakes or cupcakes. Extra concession items that may be available to purchase with your Birthday Party include birthday hot dogs, pizzas, cheese sticks, and chicken strips. Please inquire about item availability at your local theatre when reserving your Birthday Party, as only certain locations offer an expanded concession menu. May we decorate the Birthday Party room? You may bring your own table clothes, plates, napkins, etc. to help theme your Birthday Party. However, we do not permit anything to be attached to the walls of the Birthday Party room. Balloons are permitted in the Birthday Party room but not in the auditorium. If the showing for my movie is sold out, will my Birthday Party guests be able to sit together? Your Birthday Party host will reserve the seats in the auditorium so that your guests may sit together even in sold out showings.